If anybody can speak with authority on how fast Colorado’s market for luxury homes is recovering, it’s Michael Kozlowski, the top-selling agent of powerhouse brokerage RE/MAX Professionals, not only this year but for each year since 2010, when the market hit its recession low. 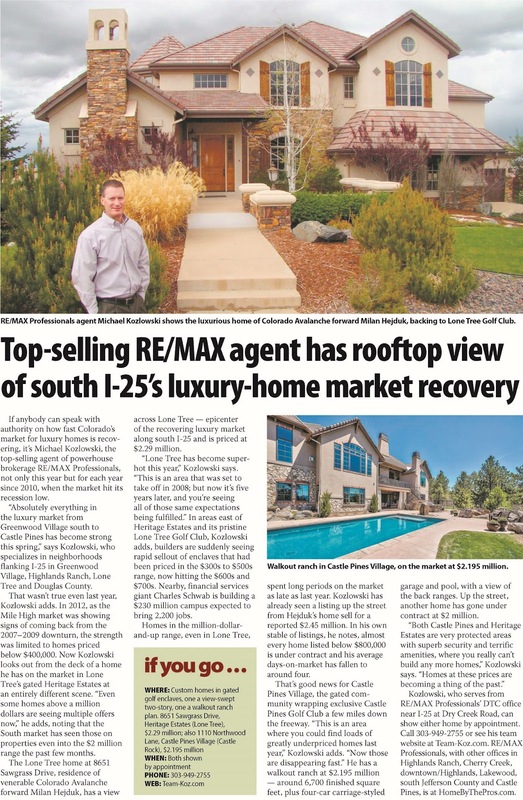 "Absolutely everything in the luxury market from Greenwood Village south to Castle Pines has become strong this spring," says Kozlowski, who specializes in neighborhoods flanking I-25 in Greenwood Village, Highlands Ranch, Lone Tree and Douglas County. That wasn’t true even last year, Kozlowski adds. In 2012, as the Mile High market was showing signs of coming back from the 2007–2009 downturn, the strength was limited to homes priced below $400,000. Now Kozlowski looks out from the deck of a home he has on the market in Lone Tree’s gated Heritage Estates at an entirely different scene. "Even some homes above a million dollars are seeing multiple offers now," he adds, noting that the South market has seen those on properties even into the $2 million range the past few months. The Lone Tree home at 8651 Sawgrass Drive, residence of venerable Colorado Avalanche forward Milan Hejduk, has a view across Lone Tree — epicenter of the recovering luxury market along south I-25 and is priced at $2.29 million. "Lone Tree has become super-hot this year," Kozlowski says. "This is an area that was set to take off in 2008; but now it’s five years later, and you’re seeing all of those same expectations being fulfilled." In areas east of Heritage Estates and its pristine Lone Tree Golf Club, Kozlowski adds, builders are suddenly seeing rapid sellout of enclaves that had been priced in the $300s to $500s range, now hitting the $600s and $700s. Nearby, financial services giant Charles Schwab is building a $230 million campus expected to bring 2,200 jobs. Homes in the million-dollar-and-up range, even in Lone Tree, spent long periods on the market as late as last year. Kozlowski has already seen a listing up the street from Hejduk’s home sell for a reported $2.45 million. In his own stable of listings, he notes, almost every home listed below $800,000 is under contract and his average days-on-market has fallen to around four. That’s good news for Castle Pines Village, the gated community wrapping exclusive Castle Pines Golf Club a few miles down the freeway. "This is an area where you could find loads of greatly underpriced homes last year," Kozlowski adds. "Now those are disappearing fast." He has a walkout ranch at $2.195 million — around 6,700 finished square feet, plus four-car carriage-styled garage and pool, with a view of the back ranges. Up the street, another home has gone under contract at $2 million. "Both Castle Pines and Heritage Estates are very protected areas with superb security and terrific amenities, where you really can’t build any more homes," Kozlowski says. "Homes at these prices are becoming a thing of the past." Kozlowski, who serves from RE/MAX Professionals’ DTC office near I-25 at Dry Creek Road, can show either home by appointment. Call 303-949-2755 or see his team website at Team-Koz.com. RE/MAX Professionals, with other offices in Highlands Ranch, Cherry Creek, downtown/Highlands, Lakewood, south Jefferson County and Castle Pines, is at HomeByThePros.com. - 4,714 homes closed for a closed dollar volume of $1.4 Billion. Prices are up 5% in the Denver Metro area from last month, 12% from this time last year, putting the average home prices at levels not seen since their 2006 peak. Over 50% of the homes available for sale were on the market less than seven (7) days. After nine months of inventory decline, the inventory of homes available for sale increased 4%. Multiple offers are now the norm in some price ranges and on occasion lead to bidding wars. Overall, the Denver home market has less than a two month supply of homes available for sale at the current sales rate. Single Family Residential homes have a 1.73 month supply and Condos have a 1.59 month supply. Current media headlines proclaim “Denver Home Prices Soar As Buyers Battle It Out In Bidding Wars”. What does this mean to you as a seller? The Denver home market is experiencing a speed in the market that has never been experienced. Homes are coming onto the market and within days are under contract. In the short period of time while the home is available for sale, it is not uncommon for the property to have multiple showings resulting in multiple offers. - What is the impact of multiple offers? - What are creative offers? - How do I evaluate multiple offers? Each and every one of the above questions needs to be answered. Since selling a home is not an everyday activity, a seller needs to look to a professional for assistance. The overall advice to sellers is the same as to buyers. Research your priorities, know your objectives, be prepared, and manage your expectations in this market. While the Denver home market can be portrayed as a “seller’s market”, each and every home is unique which suggests professional assistance in selling the home. Know what you want in a home, where you want to live, and what price range you can afford. Be prepared for the speed of the market with low inventory and multiple offers. Manage your expectations in order to timely participate in the home buying market. Gorgeous Home in Parker! Won't Last! Great Price! Full Finished Walk-out Basement! Huge Square Footage! Great price in The Hearth! Spectacular Upgrades! Slab Granite Everywhere! Impeccable Home! Don't Miss Your Opportunity!